It's Senior Night Morning for the Boilermakers as Purdue hopes to send DJ Byrd and Dru Anthrop out on a winning note in their last game in Mackey (barring a potentially likely CBI bid or at least two wins in the Big Ten Tourney for an NIT bid). Can the Boilers shake off the tough loss on Wednesday night and play with the same passion as they showed for the last 30 minutes of the game against the Wolverines? There's A LOT to play for on Saturday, and a win would greatly improve Purdue's (admittedly miniscule) chances at making a run for the BTT Championship. Isn't that a mouse? If not, that's the ugliest Gopher I've ever seen. 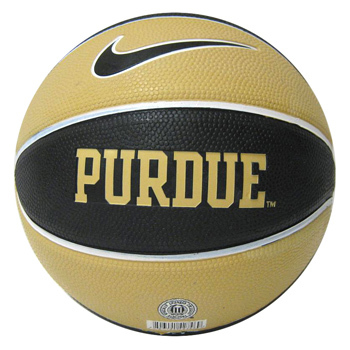 If Purdue plays the way they have over the last two games, the Boilers will win this one going away. Purdue is playing at the same level as the conference leaders right now and home court advantage should be the difference maker even if the shots aren't falling. The Gophers have lost seven straight road games and are coming off a miserable 53-51 loss at Nebraska. Meanwhile, Minnesota's big wins this year have typically been against fast-paced teams. Indiana, Michigan State, and Illinois all have a similar style in which Minnesota tends to excel against. Other than an ugly 58-53 overtime home win against Wisconsin, the Gophers have lost low-scoring affairs against Northwestern, Wisconsin, Iowa, Ohio State, and Nebraska. This is a great matchup for the typically low-scoring Purdue squad and is a golden (excuse the pun) opportunity for the Boilers to pull out a win. Just when you think you have this Purdue team figured out, they tend to completely switch gears. Consistency has been pretty much nonexistent - I mean, this is the most consistent Purdue has been all year, and they've played two good games in which they didn't show up until 10 minutes into the game. If Andre Hollins gets hot from behind the arc early, the Boilers cannot afford to have another one of their turnover-prone stretches that started the Michigan game. Add the fact that Sandi Marcius is questionable, and this becomes Minnesota's game to dominate down low - they have 4 players 6' 7" or taller who played at least 18 minutes against Nebraska. Trevor Mbakwe has a chance to have a huge game, giving the Gophers a huge victory and securing their spot in the NCAA Tourney (they probably need to win either this one or a game in the BTT to cement their bid). I mentioned Purdue has a lot to play for. Assuming Iowa beats Nebraska and Ohio State beats Illinois (both at home), Purdue will need a win for the 7th seed. A loss will put them in 9th no matter what happens. A 9th seed gives Purdue a first round game against Illinois, and a second round game against Indiana. Both will be extremely difficult and of all the teams in the Big Ten, Indiana is the only team that has dominated Purdue. Even if they somehow get past both games, they'd still only be halfway to an NCAA Tourney Bid. A 7th seed gives Purdue a first round game against Nebraska, and a second round game against either OSU, Michigan, or Michigan State. Both games are SUBSTANTIALLY easier and this path would also avoid Indiana until the finals. What does this all mean? If you want to have a chance, you need to win this game. Our Picks - We like to think we're better than Vegas. So throughout the season, we'll be "betting" a whole dollar amount versus the spread. We screwed up and counted one less game, so from here on out we will be betting any amount up to the amount that the other person has (The continuation into the postseason has not been confirmed with Kirk yet, so it could change). The spread for this game is Minnesota by 2. Kirk's Pick: CONDITIONAL PICK! If Marcius is active, Purdue 65 - Minnesota 62. If inactive, Minnesota 68 - Purdue 62.